2^15= 32768 and the sum of its digits is 3 + 2 + 7 + 6 + 8 = 26. What is the sum of the digits of the number 2^1000 ? 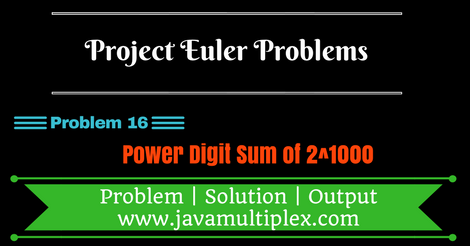 As result of 2^1000 is very big and we can't store it in any primitive data type so to solve this problem we need to use methods of BigInteger class present in java.math. * package. * @Problem 16 - Power Digit Sum. // Converting Integer to BigInteger. // Converting BigInteger to String. How to calculate factorial of large number? How to find first 10 digits of large sum?